Good morning, my lovely readers! Over the last month or so, I have noticed that more and more of you visit my blog. I am so surprised to see that - I never thought anyone would read this blog apart from me. To express how grateful and happy to see that you guys do, and to thank you for your lovely messages, tweets, likes and general support and love, I have decided to give you something sweet to make your summer days more enjoyable. There is nothing better, than a scent that reminds you of a particular summer or a particular holiday, and this sweet Candy is delicious for it. I bought it for myself recently and I know how my summer 2012 will smell forever. 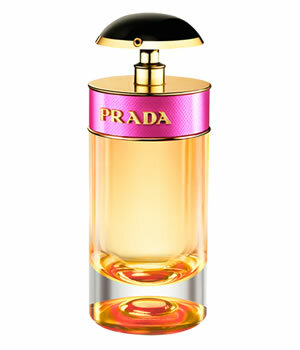 I am giving away 30ml Prada Candy Eau de Parfum Spray to one of you, my lovelies. The winner will be chosen randomly on the 1st of August by me. You can enter from any part of the world, will happily post the present. Simply leave your name and contact details so I can contact you if you win. Boys, this is for you too, I am sure there is a special lady that would love you for giving this to her. What a brilliant giveaway! I would love the rest of this summer to smell like this perfume.Weather has been horrible, so this would totally cheer me up. My Twitter address is @andreruta, email address andreruta@gmail.com. Great giveaway, I LOVE perfume! Followed you via Bloglovin as c.childs@live.co.uk and also liked the post! Great give-away, is it world-wide? if it is i'm in! I am Emma from Ohio and I love your blog! I have followed you on Bloglovin too. Fingers crossed! i'm happy to enter this giveaway! OKAY, I have to have this perfume! So happy I came across this blog. My name is Brenda, I am from Louisiana. I am going to Europe soon and would love this to be my scent!!! bregwood@yahoo.co.uk. I have followed you on Bloglovin too for an extra chance and future blog stalking you. Oh wow this is so generous! I once had a sample of this and completely adored it, would be amazing to have a bottle for summer! Now following on bloglovin. hi, this is an awesome giveaway! I don't twitt, blog or anything else (yet) So it will only be this participation. I'm Heleonore, and can contact me at: heleonore.legrand@gmail.com. Honestly, i'm a huge perfume lover and it's difficult to find a Prada fragrance in my country. I really hopt to win this fragrance....*falling in love with it. Oh yes! Finally something I want is going to be given away!!! + Love your blog ALOT. I LOVE Prada Candy perfume! Shared this giveaway on my FB. Great giveaway, I LOVE PRADA!!!! Thanks so much for the fun giveaway! thanks for the giveaway! I'd like to win this wonderful perfume for my mother.